This section covers Driving Manoeuvres | Tips & Tricks for all four manoeuvres - any one of which you may be asked to do during your test. 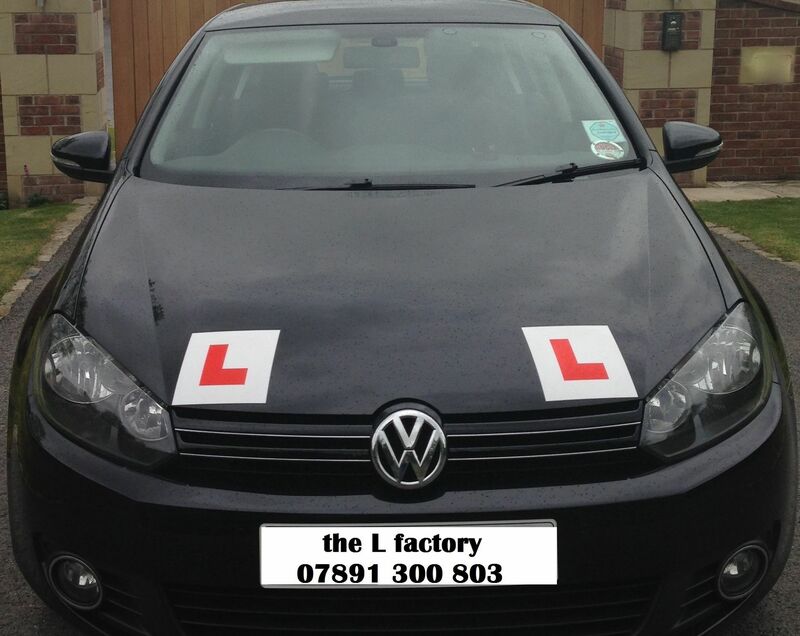 It is designed and written by experienced and qualified driving instructors. The practical driving test will involve you taking a minimum of one out of the possible four driving manoeuvres available. But you will not know which manoeuvre the Driving Examiner will request so you need to learn them all. The tutorials below show every aspect of the manoeuvre covered, including appropriate observations and reference points. It will take time to learn them until you feel confident, but if you are well prepared you will pass this section of the driving test. Observation – Don’t forget your MSM routine - Mirror, Signal, Manoeuvre! Objectives: You should be able to identify a safe and legal place to carry out the parallel park. And be be able to park reasonably close to and parallel to the kerb by reversing into a space of not more than two car lengths. The manoeuvre should be completed under control, with due regard for the safety of other road users. Avoid blocking driveways, parking too close to a junction or on double yellow lines. There’s more, so check the highway code. Apply the MSPSL (Miiror-Signal-Position-Speed-Look) routine. Remember if there is a car behind you, slow down gradually so you don’t surprise them and signal your intention to pull in. You should be roughly an open car door away from the parked car and your boot should look level with their boot. Look at diagram for more info. Turn Left when the back of your car is in line with the back of the car you are reversing behind. Reverse back for a short time until the kerb disappears in your left door mirror. Now turn Right again. 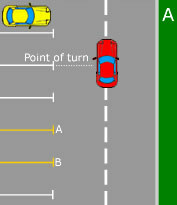 The front end of the car will begin to swing in, once it looks parallel or directly behind the car in front of you. Then straighten the wheels by turning Left to finish. Your instructor may adjust the focal points slightly depending on the car you are learning in. 1. Prepare the car and then look all around you starting from the left shoulder and finishing over the right shoulder. In total you should complete 6 checks. Also known as the 360 degree observation. You should only pull out if nobody is coming up and down the road. 2. Once you have moved out, just check your interior mirror early before pulling up next to the parked car. If there is someone behind you, then apply a signal and stop gently and smoothly next to the parked car. If there is nobody around, no signal is required. 3. Use the handbrake if necessary (if on a hill), put the gear lever into reverse and then cancel your signal if it is on. Your reverse light is on now, so vehicles behind should understand you are about to reverse. 4. Prepare the car again, so your clutch is at the biting point, so you don’t roll in the wrong direction when you release the handbrake. Also consider if you have your clutch too high, you may go flying back too fast. 5. Assuming you have prepared the car, look all around you starting from right to left. If safe release the handbrake. 6. The moment the car moves back, turn the steering wheel one full turn left (when the boot of your car is in line or just after you have passed the back end of their car). Avoid dry steering too. 7. If you need to slow down slightly, just dip the clutch. Keep looking over your left shoulder. 8. Glance in your left door mirror but don’t stare. When you see an angle that looks like a slice of pizza then you need to glance over your right shoulder quickly and turn the steering wheel one full turn right. If you need to stop to look briefly, this is not a problem. Observations are imperative. In fact the examiners would prefer full observations and a not so pretty Manoeuvre compared to a perfect parallel park and poor observations. 9. Keep reversing back slowly, looking all around you especially over your left shoulder. Imagine there is a school right near you and the kids have just finished school, it’s like an ants nest at times – even if its quiet, you need to observe as if that school has just finished. 10. Shortly you will need to turn one full turn to the right again. The best time to turn right is when you see the Kerb just drop underneath the front part of your door handle. It will vary slightly depending on the type of car you are driving, but this will work 9 times out of 10 on most hatch back vehicles. You must turn the wheel quickly in order for this technique to work be careful of over steering and try to avoid dry steering. 11. The car should begin to swing into the space, keep the vehicle speed very slow and stop if there are any vehicles approaching still, as it isn’t your priority. So you will need to keep looking in all directions, so don’t miss anything. 12. Once the vehicle looks parallel with the kerb you will need to quickly straighten your wheels to the left. You may want to reverse back slightly more just to make sure the vehicle continues in a straight line parallel with the kerb. 3.What is the examiner looking for? You cannot drive through the first parking pay, to one in front of that. When reversing, you must not reverse into any bays behind you. You can make corrections if you need to. If you enter the bay but feel like you’re too close to the lines/other vehicles, you may reverse out and start again. Give yourself a wide turning circle by safely pulling as far across the side away from your target bay, as possible. Your reference point to stop is when the end kerb or line comes just under your door mirror. When the kerb reaches this point, select neutral and put the handbrake on. Before pulling off, remember to check your blind stops and when you’re happy that it's clear - select first gear and pull away. When positioning the car for the manoeuvre, give yourself plenty of room from the bays you are reversing into. This will make the parking easier. Also making sure you leave enough room to your right as your car front will swing out. 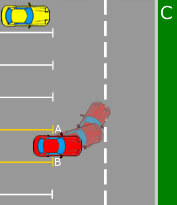 Position the car so that the passenger door has a bay line half way through it as in diagram A. 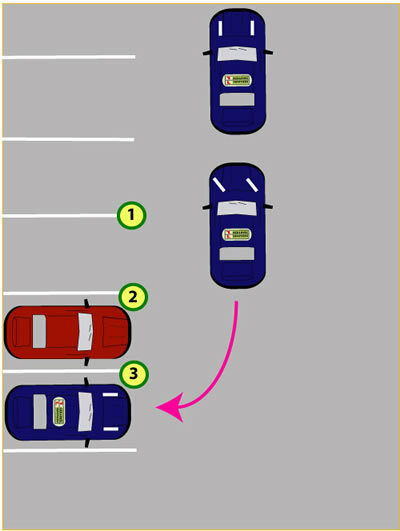 This technique will guide the car 3 bays (the yellow lines) away from the line you positioned with the car door. Once stopped, apply the handbrake and select reverse gear. Before you move the car, take a good look around to make sure there are no oncoming vehicles, cyclist or pedestrians. Look out the rear windscreen and if all clear very slowly move the car backwards, turning the wheel briskly to full left lock. Ensure you keep the car at a very slow walking pace throughout using clutch control as you need to consistently look around. Also take frequent glances in your left wing mirror as you will see line A appear. You will be able to use line A as a reference point to how you are entering the bay. If too close take off half a turn of the steer to the right. This will widen your turning circle putting you closer to line B. If for what ever reason things aren’t looking too good at this point, the examiner will be perfectly happy for you to pull forward slightly to readjust. Providing you do this safely. As you start to enter the bay, line B will come into view in your right hand wing mirror. 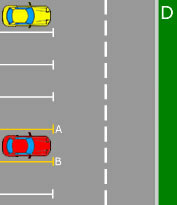 You will then be able to assess both line A and B in your mirrors to establish an equal distance from both. Providing you keep the car very slow, you will be able to constantly look around and make frequent adjustments. Don’t forget to keep looking out the rear windscreen too! If at any point during this manoeuvre a car, pedestrian, cyclist etc approaches, stop the car. Either let them go past or if they stop to let you carry on then continue with the exercise. 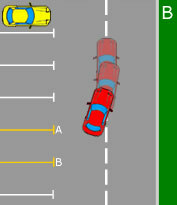 Once you have finished reversing into the bay, apply the handbrake and select neutral. Even when you have completed the manoeuvre and all has gone terribly wrong, ask the examiner if you can do it again. Time permitting, the examiner may well let you. If the manoeuvre is successful on your second attempt, you may well still pass your test.